This is probably the least interesting part of the construction process. The pattern has been thread traced onto fabric blocks, and each piece will be cut as I need it to keep raveling down to a minimum. 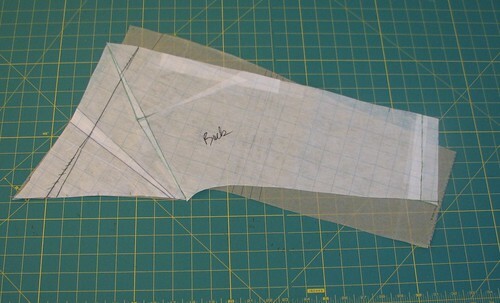 The seam allowances will also be cut extra wide and trimmed to deal with the raveling. 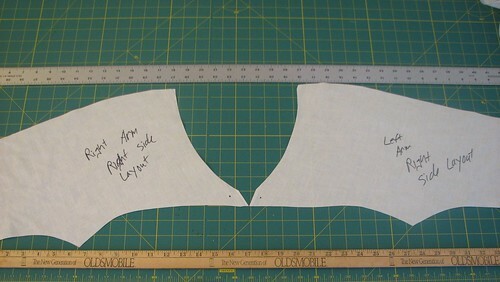 The photo on the left is a back skirt piece from the right side, and the right side photo shows the same piece with a partially basted underlining. 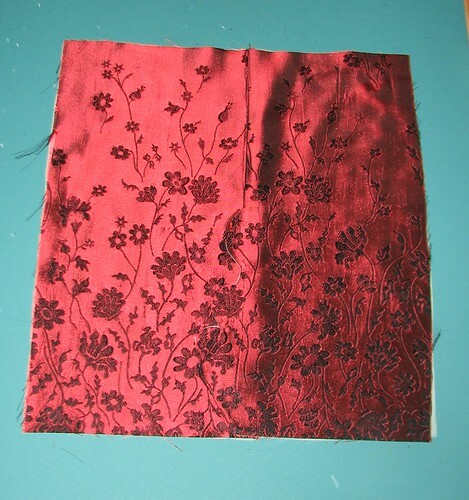 In my mind I went back and forth over whether or not to also add a lining, and then decided the organza underlining would add enough structure, and I would still be able to see and enjoy the reverse side of this brocade, which is just a beautiful as the side I chose. 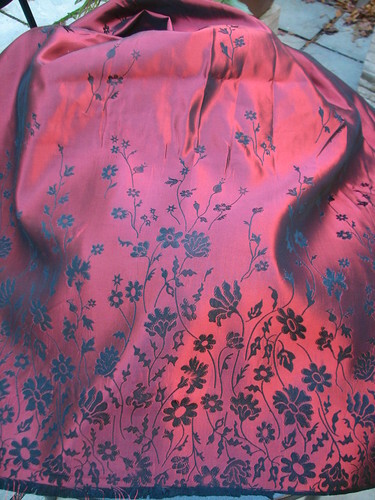 The silk organza looks much more opaque than it really is because I didn’t use a flash for this photo. The crystal beads arrived yesterday, so I mocked up the crystal picot edging. After some experimentation with thread, it turns out that the best one for this application is a double strand of Guterman silk (sold on the blue spool you see below.) I tried Nymo, a beading thread, but it was too stiff, and a single strand of Guterman was not strong enough to hold the beads upright along the edge of the fabric, which is on a slight bias for the upper bodice. However, a double strand of Guterman silk is perfect. The needle is a sharp with a small eye. 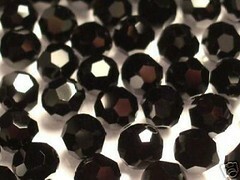 The Swarovski crystals are size 2mm; about the same size as a seed bead. If I can get all of the pieces pinned and then thread basted to the underlining I’ll be making good progess for today. 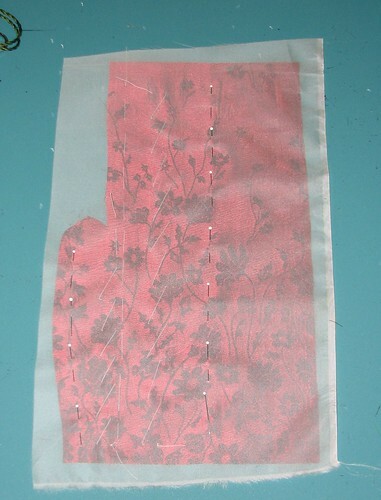 One thing I love about this fabric is the beautiful floral border, which will run along the hem of the dress. A vertical side seam all the way to the hem would split the lovely pattern, and I wanted to preserve that as much as possible. So I’m planning to combine two techniques; the “appliqué seam”, and a quilting technique known as “balloon appliqué”. If you have a copy of Couture Sewing Techniques by Claire Shaefffer, go to page 55 and look at the horse to the left on the Schiaparelli “Circus Jacket”. 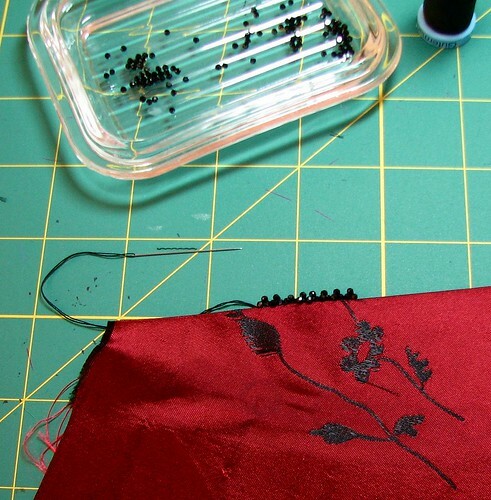 An appliqué seam combines a regular seam and hand appliqué when you want to preserve a shape across a seam. Claire published an article in the May/June 2004 (#94) issue of Sew Beautiful where she illustrates how to do this technique. I’ve been keen to try it ever since, and this project was perfect except for one problem; this silk brocade ravels instantly and badly, no matter how carefully I handle it. There was no way I’d be able to turn under the edges of the appliqué without shredding the fabric. 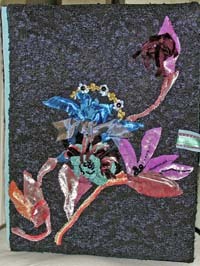 Turn the appliqué – you have just done the balloon appliqué technique. 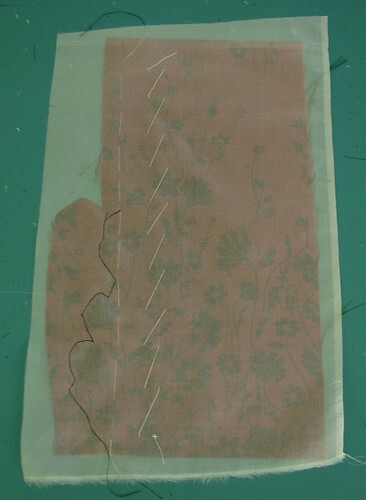 Now align the seam allowance and sew the seam, stopping at the turned out balloon appliqué. 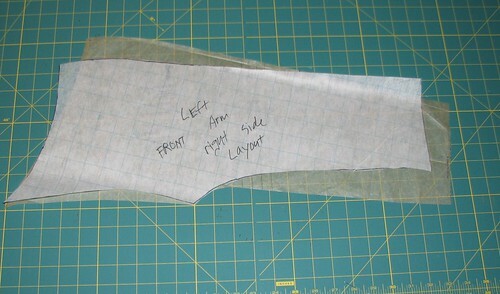 Note: There is also a piece of silk organza underlining on the matching pattern piece. Flip the two pieces over and bring the appliqué to the right side. You’ll see that I will need to finish this raw edge; I’ll probably machine sew a length of rayon seam binding over the raw edge, and then hand fell stitch the edge to the silk organza. 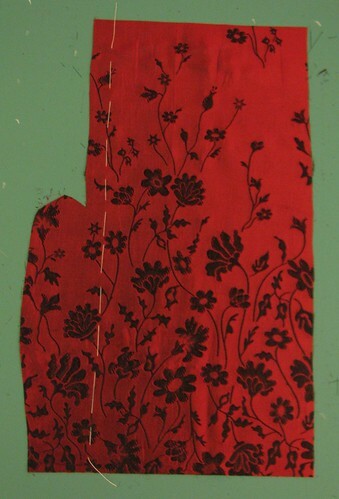 Likewise, the edges of the appliqué need to be hand fell stitched to the fashion fabric. I trimmed too close in a few spots and the fabric has come apart and raveled; I need to watch for that. The white edge you see is the silk organza; I suspect the black won’t be noticeable. If I see some funny breaks across motifs, I can individually balloon appliqué a full size of a motif on top of another of the same motif. On the real dress the front piece will have balloon appliqués seaming that wraps towards the back; I think that’s the most elegant way to use this seam from a design standpoint. 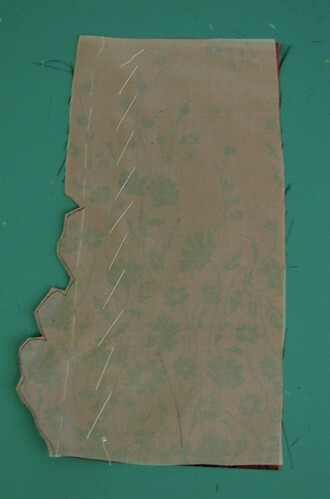 My hand stitching will need to be strong and minute since there will be stress on this seam while I wear the dress. 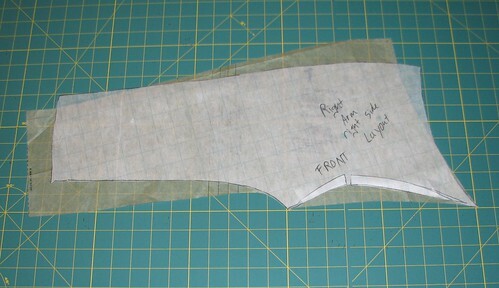 Even though I’ve mocked up the seaming technique; I still have planning to do. I’ll need to figure out the order of construction in advance so I can do the appliqué and hand stitching both inside and out while the dress is still in a partially constructed flat stage. Plus there is a center back invisible zipper to install as well. Today is prep day for Thanksgiving at our house (15 people) and since I’m still waiting for materials to arrive I’ll have a few days think about the construction. I’m not in the least upset that it’s taken me four muslins to correct the fit, because the challenges are totally due to my shape. 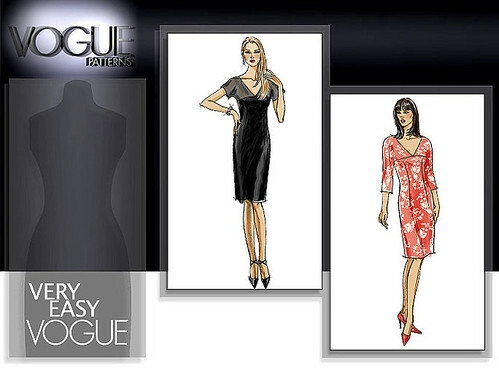 Vogue slopers, as well as McCall’s, have linebacker shoulders, and I’m just the opposite. When I tried on the original muslin, even though it was a 14, my normal size, the upper bodice was so big it slid right off my shoulders! A few more tweaks and I should be ready to move onto the fashion fabric. 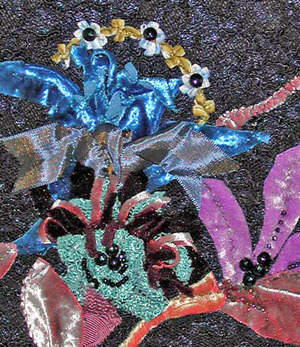 The Swarovski crystals are on their way from Fire Mountain Gems & Beads, and I discovered that I do have enough fabric for applique seams at the sides. 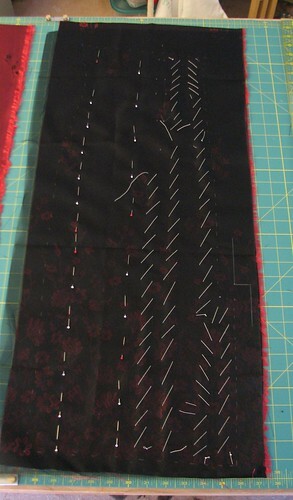 Gotta order some black silk organza for an interlining, and then the fun begins! I’ll do the 3/4 sleeve version. 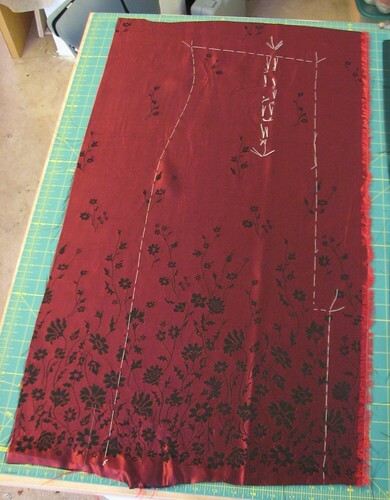 The fabric is a deep garnet silk taffeta brocade with a floral border design on the cross grain (a gift from Ann of Gorgeous Fabrics). 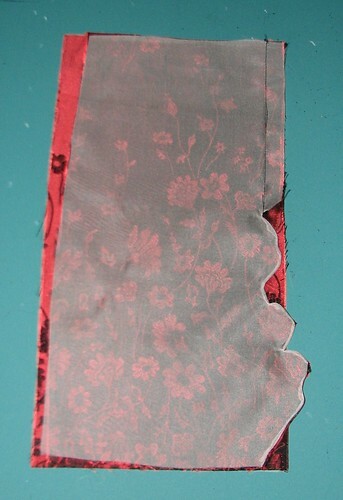 The floral pattern (about 18 inches deep) will be along the hem and it thins out to scattered floral motifs. 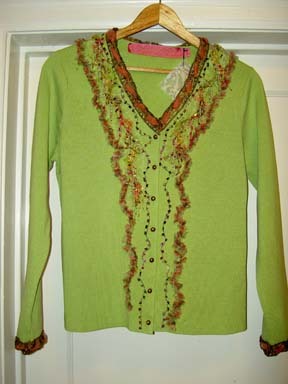 I’ll bead the deep-v neckline front and back as well as the sleeves with jet Swarovski crystals in a picot edge. 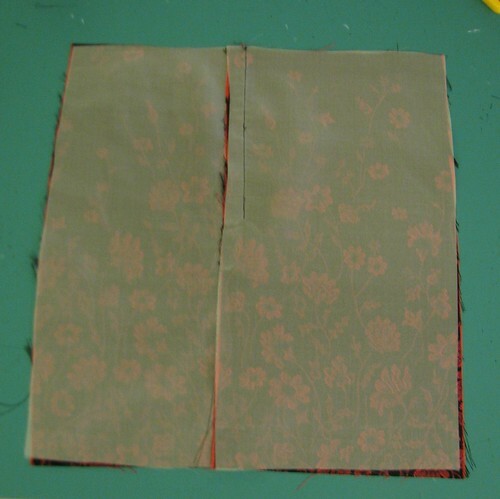 Maybe, just maybe, and if I’m careful and lucky with the layout, I’ll have enough fabric to do an appliqué seam at the sides – it would be nice to preserve the floral pattern all the way around the hem. The pattern doesn’t call for a lining, but adding one in black China silk won’t be difficult. 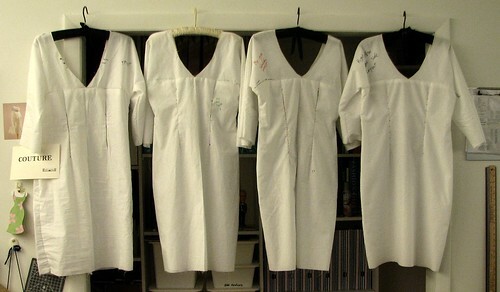 The party is December 14 – it’s time to get going on a muslin!